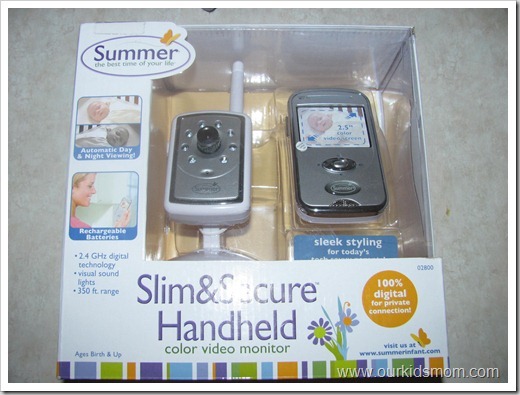 For parents looking for the ultimate stylish color video monitor that allows them to view baby both day and night, there’s the Slim & Secure Handheld Color Video Monitor from Summer Infant. It’s small, sleek and stylish design makes parents feel like they’re watching the little one on their cell phone. 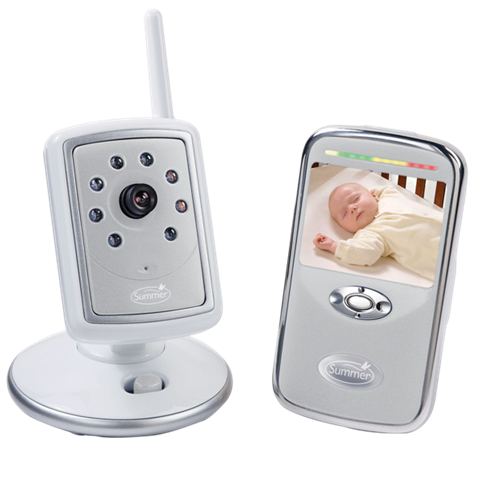 It’s today’s most sought after baby monitor and gives parents the reassurance they need by allowing them to hear and see baby – day or night. My husband teases me (often) about being an over protective mom. It is not enough for me to hear what is going on in Ethan’s room… for my peace of mind I need to see what is going on as well. I wasn’t like this with Kaytlin and Josh. Sitting here trying to figure out what is different now from then… the only thing I can think of is that Ethan uses a sound machine so there is always white noise coming through the audio. A lot of times this can mask the fact that Ethan is up and around (and sometimes climbing on things he shouldn’t be… he’s all boy!). Our old video monitor bit the dust (not the monitor’s fault… but that’s another story) so I contacted Summer to see if we could review one of their units. When they agreed I was giddy with joy! The Summer Slim & Secure Color Handheld Video Monitor comes with everything seen above. 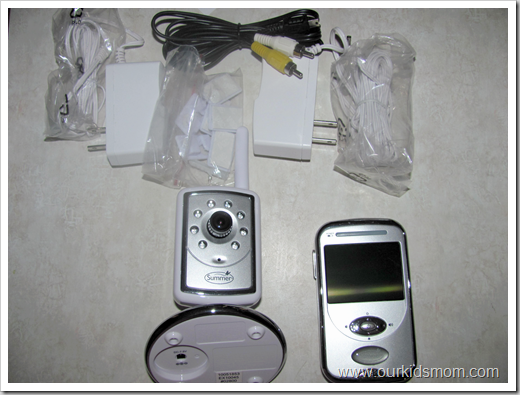 The camera, receiver, two a/c plugs, mounting tabs (use if needed) and the cord to plug it into the television for family entertainment viewing or DVRing (and yes, it’s can be entertaining!). We mounted the camera to the wall, plugged it in, plugged the receiver in and then we were in business! Ethan was a little freaked out at first, but he is a strange bird and does not like new “things” in his room when he goes to sleep. He will ask us to take it out when we leave after reading to him. It doesn’t happen as often, but it still does. I actually took this photo in a pitch black room… I knew where to aim because the camera has a little green light on it to let you know it’s on. The next photo is a shot from the receiver. Remember, I mentioned that when I went upstairs the room was completely dark. 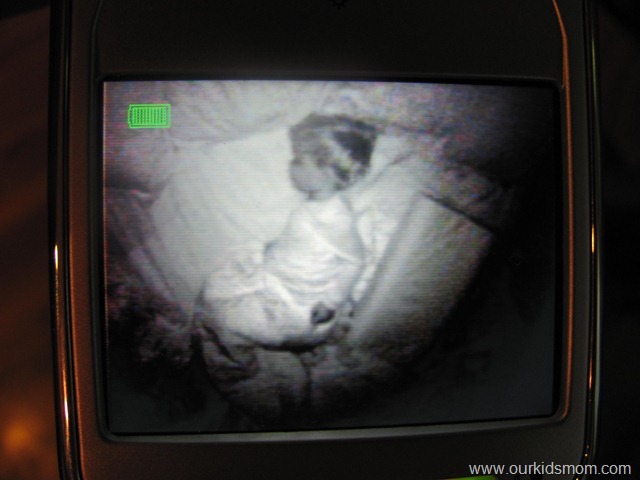 The camera has a small infrared light that allows you to view your child even in complete darkness. The picture is a bit grainy and in black and white… but you can totally see what is going on in the room. Daylight viewing is crisp and in color. I love everything about this video baby monitor. The ease of installation, the size (both the camera and receiver are very compact), the ease of use (plug and go), the picture quality, the rechargeable battery in the receiver, and the peace of mind that comes with being able to peek at your child without disturbing them. Although it is not a necessity, being able to plug it into a television for family viewing (and DVRing) is a nice plus. Children tend to chatter while in bed… they are practicing words and sounds they learned that day. It is so much fun to hear and watch them during this winding down time. I would highly recommend this video baby monitor to anyone. The peace of mind (and better sleep because you aren’t worrying) is worth the price. 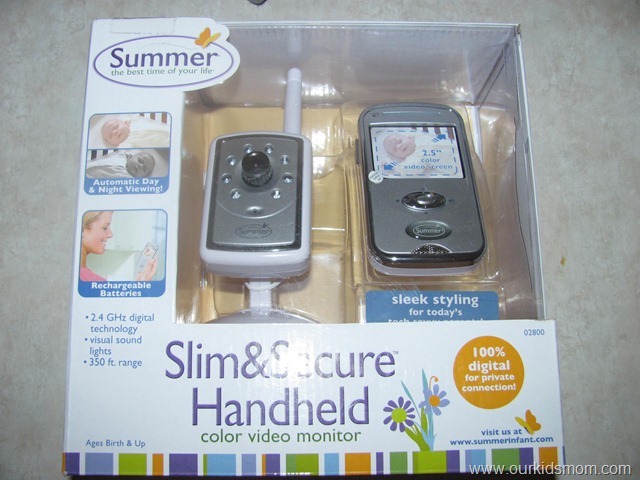 One OurKidsMom reader is going to win a Summer Slim & Secure Color Video Baby Monitor! This giveaway ended at 11:59PM EST on June 14, 2011. I also really like the Easton tote. entry 1: 3-Stage Reward Potty Trainer & Step Stool: I really liked the look and functionality of this trainer. I like the Dino Potty Training Buddy (Boy). Thanks. I LOVE Summer Infant! Especially their SwaddleMe wearable blanket. These are so useful to keep babies warm and safe! I like Summer Infant on Facebook as A.C. Cabrera! I Really like their monitoring systems. thank you for putting this product in the giveaway. Iam sure how ever wins this will have an ease of mind when they can see their baby . Follow you and Summer Infant Twitter as @ChamboriBlog and Tweeted! I am following OurKidsMom via Google Friend Connect (Veronica) Thanks! thank you for hosting this wonderful giveaway! i’d also really love to have The Summer Infant Mother’s Touch® Soothing Bassinet! I also learned about the Summer Cares Foundation and how it has been helping improve the lives of parents and children for over 10 years. I love the SlumberSack™ Sleeveless – perfect gift for the SIDS-conscious mom, what peace of mind! I like Summer Infant Mother’s Touch® Soothing Bassinet. I learned that they are the ones who also make the swaddleme and the swaddlepod! I have been considering the latter for my baby due in July. I liked ourkidsmom on FB! I visited Summer Infant site and want one of everything! Mostly I would LOVE a video monitor! I subscribe to Ourkidsmom via RSS feed! I “Like” Summer Infant Products on Facebook. I like the Lil’ Luxuries Whirlpool, Bubbling Spa & Shower on their website. I would love the Carter’s® Animal Parade Cozy Comfort Swing. So cute!!! I like the Lil’ Luxury Bubbling Spa and Shower! I like the sponsor on FB: Alexandra Herring, I also checked out their giveaway on FB! I like the Stylish and Secure Deluxe Wood Stairway Gate – it would look great at the top of the stairs and then I can stop worrying about my little one tumbling down the stairs. Wow! The Lil’ Luxuries Whirlpool, Bubbling Spa & Shower is awesome. Wow! 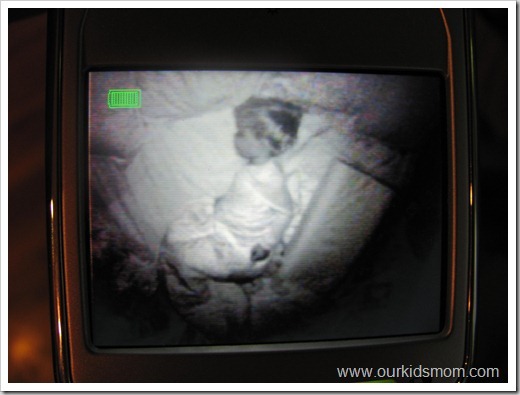 The Baby Moments Digital Video Monitor looks great too! Thanks for the chance, we really need one of these! I love the compact design! Follow you on Google Friends Connect. I also love their Carter’s® Elephant Parade Collection Comfort n’ Care Playard & Changer! We had the Soothing Baby Spa & Shower for my first son. Loved it!!! I like Summer Infant Products on Facebook. I have your button on the bottom of my home page. I love the multi view hand held color monitor! Liked Summer Infant Products on Facebook and left them a comment I found them here. I like the Lil’ Luxuries® Whirlpool, Bubbling Spa & Shower. I like/want the Secure comfort Foam Booster. Visited Summer Infant website. I like the idea of video monitors and how many of them include both audio/video capabilities. I follow OurKidsMom on GFC. 1. I subscribe to OurKidsMom via RSS feed. 2. I subscribe to OurKidsMom via RSS feed. I also entered your giveaway for the jewelry. I also entered the Mickey Mouse clubhouse movie giveaway. I also entered the Munchkin giveaway. I learned there are warranties on their products. 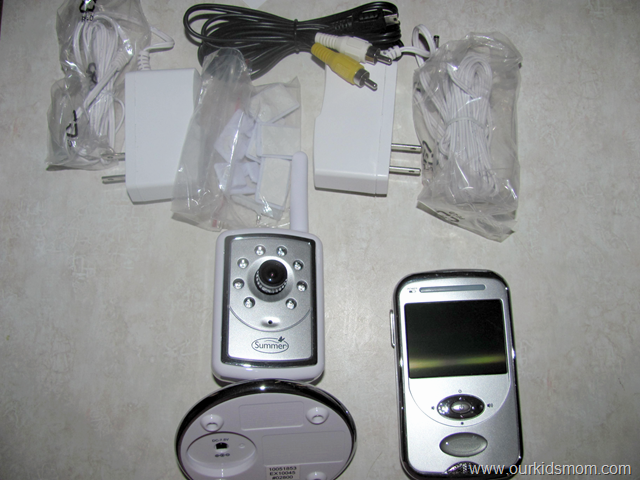 I entered you Summer Baby Monitor giveaway. i love the info dr dr alanna levine.. so many helpful questions answered. Especially for pregnant people like me! I entered you Baby Breeza giveaway. I entered you Munchkin Snack Bag giveaway. I entered your little tykes cozy truck giveaway. I like the Rest Assured Sleeper. 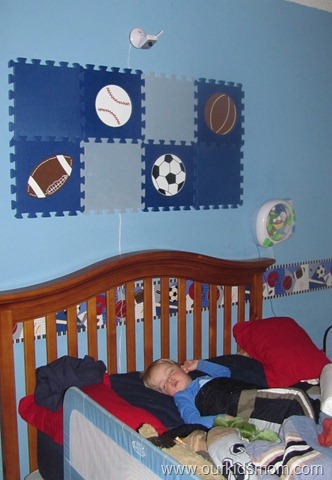 SecureSurround™ Playsafe Playard looks real nice! I would love to have the Newborn to Toddler Fold Away Baby Bath also! I love the Lil’ Luxuries® Whirlpool, Bubbling Spa & Shower. I really like this Walk through tall gate at SUmmer INfant! I love their Lil Luxuries Whirlpool Spa Bath and Shower!!! We have two of their monitors and one of the screens went out, so we really need another one! I can only hear and not see my daughter. I like the security of being able to see her. I like Summer on FB! I would like to get the Snuzzler® Bouncer as baby shower gift for my girlfriend. I like the SwaddleMe Blankets. I learned that Summer Infant makes a variety of products. I have only seen their monitors and did not realize how many other products they manufacture. I like the Mother’s Touch Infant Bath Tub. I entered the Summer Infant monitor contest, as well as the Munchkin bags. I ‘like’ Summer Infant and OurKidsMom on Facebook, subscribe to the emails as well!! I HATE HAVING TO TRY AND CHANGE THE SHEET WITH THE BUMBER IN MY DAGHTERS CRIB. THE EZ CHANGE SHEET SOUNDS GREAT, AND I WOULD FEEL ALOT BETTER ABOUT HAVING THE BREATHEEASY BUMBEP TOO! I found out they donate to a group called KIDS to help0 kids in distressed situations. I entered $50 GC to Stella and Dot giveaway. I entered the Protect a bed giveaway. I would love to have their newborn to toddler bath center and shower. Plus their multi way monitor. The whirlpool baby bath looks awesome! Absolutely love their stuff. Love the Disney Princess booster seat! I had no idea that Summer Infant was the brand of the swaddling blanket my wife uses. We absolutely love it for our little 2mo old. Great site, and really excited about this giveaway. We just happened to be in the market for a video monitor and found your blog. Will be subscribing now for sure! I also entered the Sleepy Sac giveaway. I also entered the Little Tikes giveaway. I also entered the Bath and Body Works giveaway. I learned that Summer Infant has been a proud supporter of the March of Dimes since 2006. That’s fantastic! I follow on GFC as Terri. I Like OurKidsMom on Facebook as Terri Winsome. I “Like” Summer Infant Products on Facebook as Terri Winsome. I love the Prodigy Inifant Car Seat! I also like the Carter’s Whisper Classic High Chair. Entered the Little Tikes giveaway. Entered the Baby Brezza giveaway. Entered the Gnomeo & Juliet giveaway. I want the Newborn-to-Toddler Fold Away Baby Bath. I love that their website has a product registration form right online! How easy is that?! I want the Carter’s® Love Bug Cuddle Me Travel Swing. 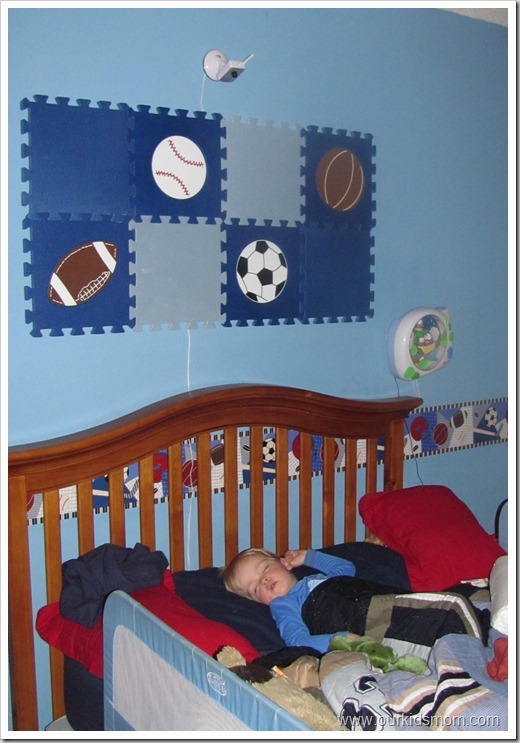 The Snuzzler Bouncer looks so cute and would be perfect for my baby coming in July…. entered your Echo Drop Cam giveaway! Visited Summer Infant site: Would love to get the All In One Potty Seat and Step stool, the Contoured changing pad, Sure and Secure Disney Cars Single Bedrail and the Slim and Secure Video Monitor. Also entered the MMCH Mickey Great Outdoors w/ Mickey Mote Giveaway. I’d also love to own the Prodigy Infant Car Seat. I entered the 3 preschool DVDs giveaway. I really want any of their video baby monitors! Entered Bath and Body giveaway! Entered Gnomeo and Juliet giveaway! Entered Fanboy and Chum Chum giveaway! I like the Swaddle Me and Wearable blankets. I like the Disney Princess bed rails from Summer Infant. Cute!